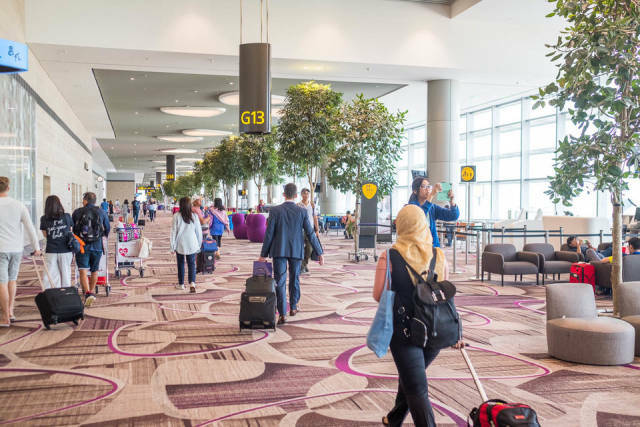 Singapore's Changi airport is one of the busiest airports in the world, serving 62.2 million passengers last year. It is a major hub for flights through Asia. I recently flew through Changi on three occasions. I had heard it's been ranked the number one airport in the world, but I wasn’t sure what to expect. 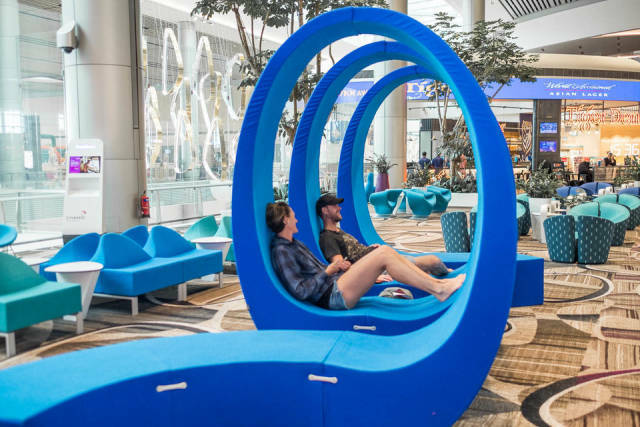 The airport has a ton of eye-popping amenities. 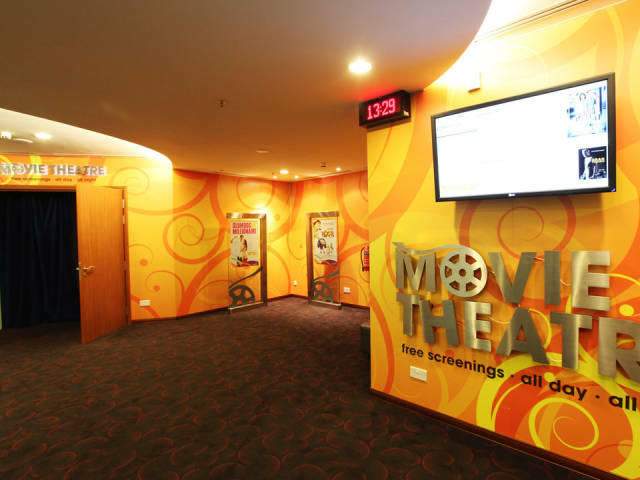 There's the free movie theater in Terminals 2 and 3, which plays first-run movies. While I was in town, it was playing Justice League, The Post, and Despicable Me 3. 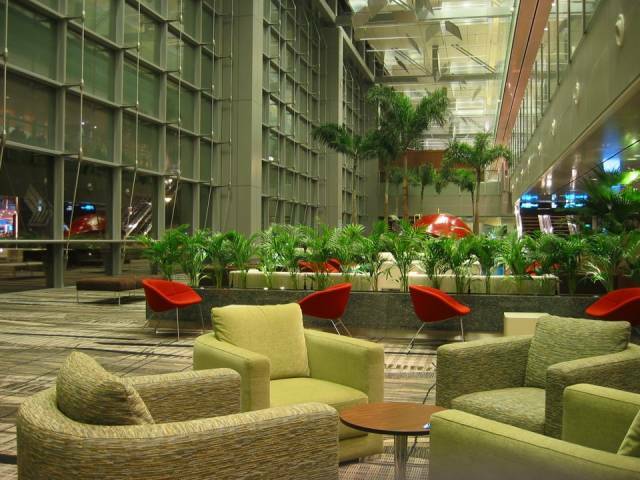 Terminal 1 has a rooftop swimming pool that travelers can access for 17 SGD ($13). It also has a Jacuzzi, showers, and a bar. 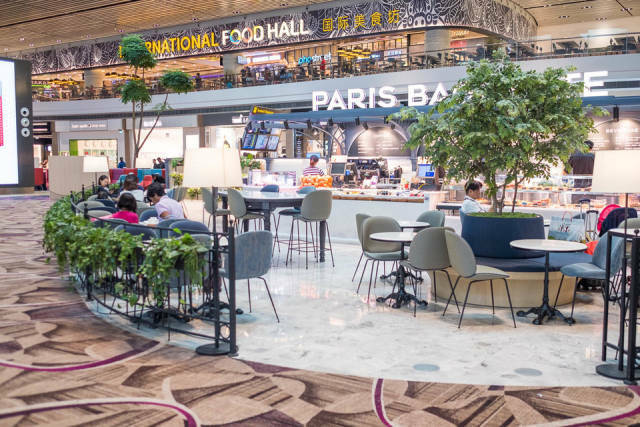 Terminal 3 has a 1960s-themed food court that mimics Singapore's world famous hawker stalls, where street vendors cook up local specialties for cheap prices. 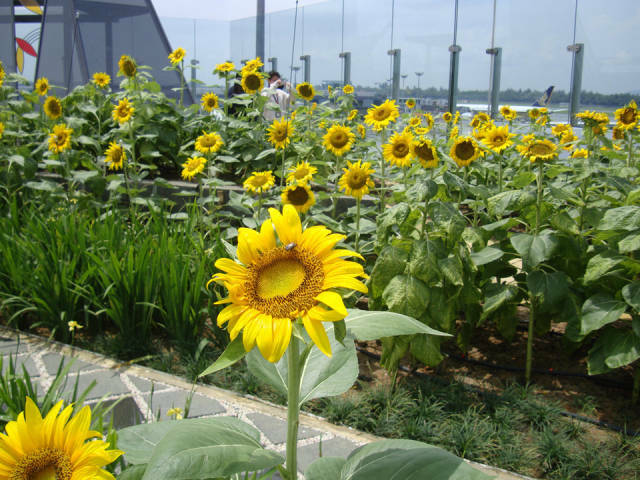 And the butterfly garden at Terminal 3, where travelers can while away their layover by spotting over 1000 exotic butterflies. But, to be honest, I never experienced these amenities. All of my flights passed through Terminal 4, the airport’s newest terminal. 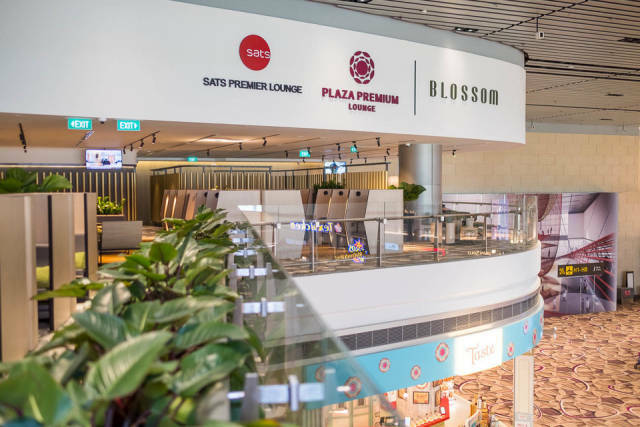 It opened in October and currently hosts flights from Vietnam Airlines, Cathay Pacific, Cebu Pacific Air, Korean Air, Spring Airlines, and AirAsia. It's designed to handle 16 million passengers per year. 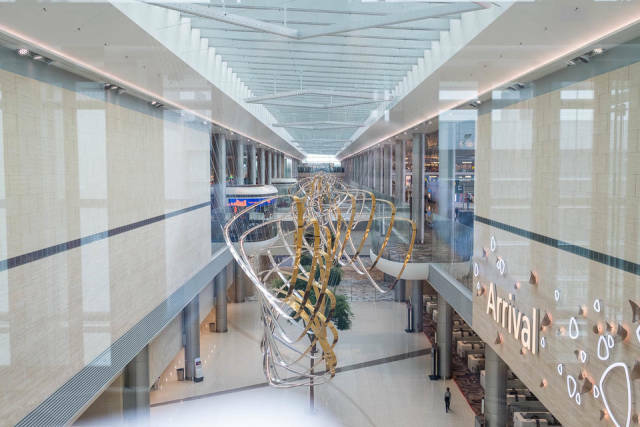 The concept behind Terminal 4, according to communications director Dennis Yim, is to take all of the best elements from the airport's other terminals and try to make as seamless an experience as possible. It cost $737.5 million to build and is packed with a ton of cutting edge technology to create a "contactless" experience. When I walked in, the first thing I noticed was how tall the ceilings were and how open the check-in area felt. All the check-in counters only go up to about chest-height, which means that you can see from one end of the terminal to the other. 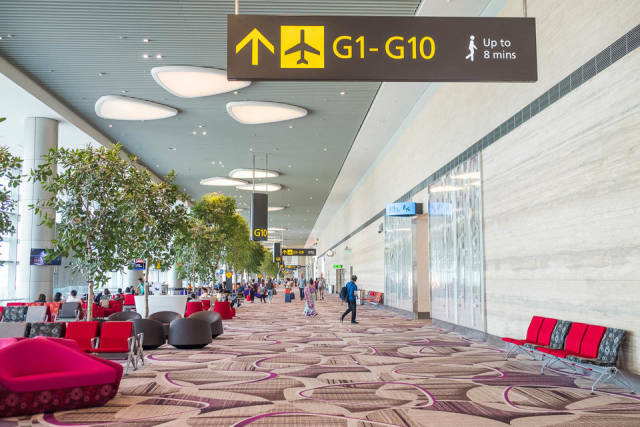 Terminal 4 is piloting Changi Airport's FAST (Fast and Seamless Travel) system. 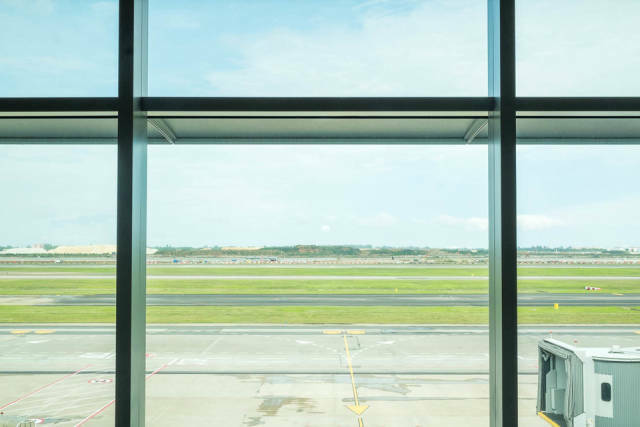 The idea behind it is that a traveler should be able to go from check-in to their plane without ever talking to another human, if he or she wants. 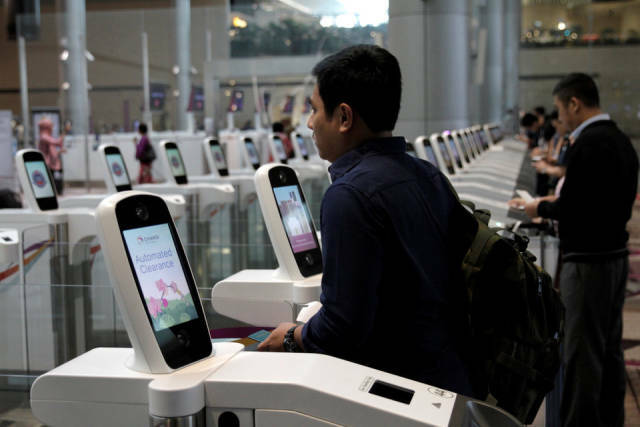 There are automated kiosks to check-in and print luggage tags and boarding passes. There were so many that even before a busy flight to Seoul on a recent morning, I didn't have to wait more than a couple minutes to get an open kiosk. It helps that the check-in app is very intuitive and fast. Afterwards, I went to an automated baggage drop. 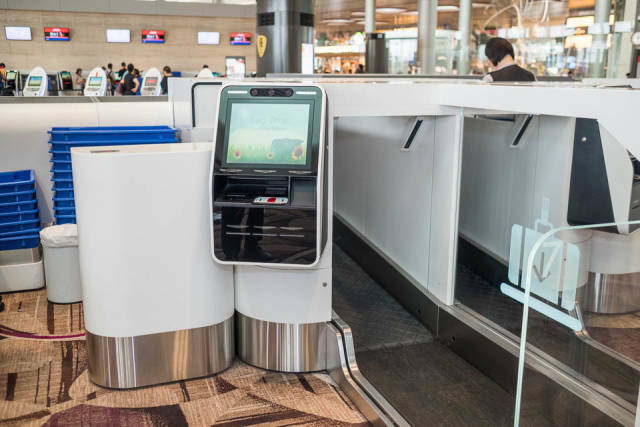 It has a similar kiosk that asks you to scan your passport and boarding pass. It weighs your bag on the spot and scans the baggage tag. The only downside is that it's impossible to give a robot puppy-dog eyes when your bag is even 0.1 kilograms over weight. I had to step out of line to repack. The machine won't open to take your bag unless everything is correct. 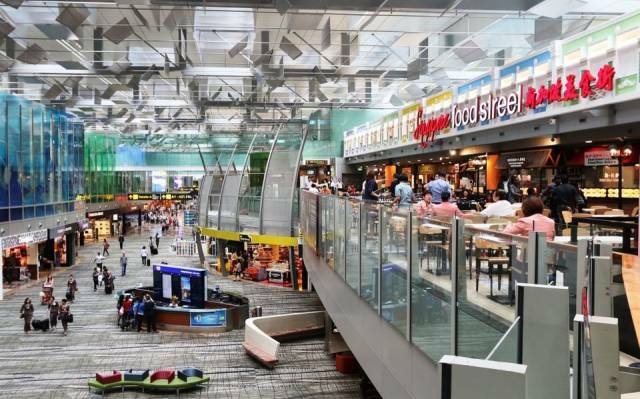 The airport has tons of shops and restaurants on its land-side. 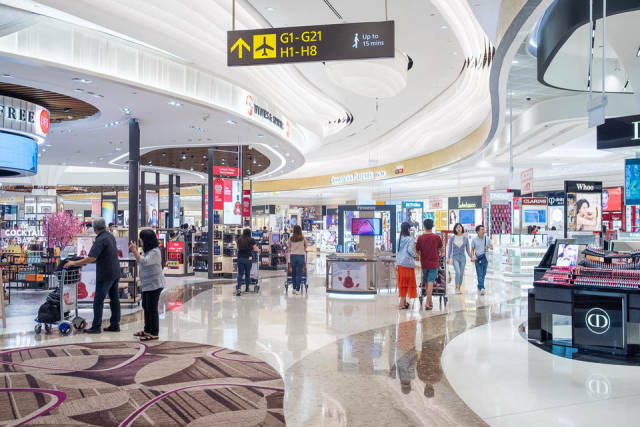 Because the airport is so accessible — only about 20 minutes from downtown by car — many Singaporeans come just to shop and eat, particularly during the holidays. 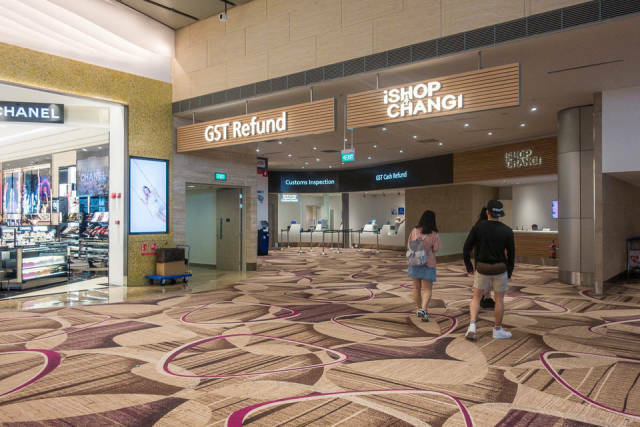 It doesn't hurt that airport shops don't charge tax. 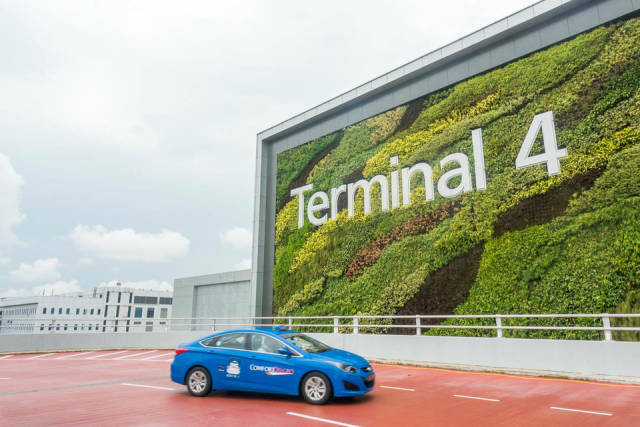 The Singapore-based Straits Times has called Terminal 4 "a huge experiment in how to run an airport with minimal staff." 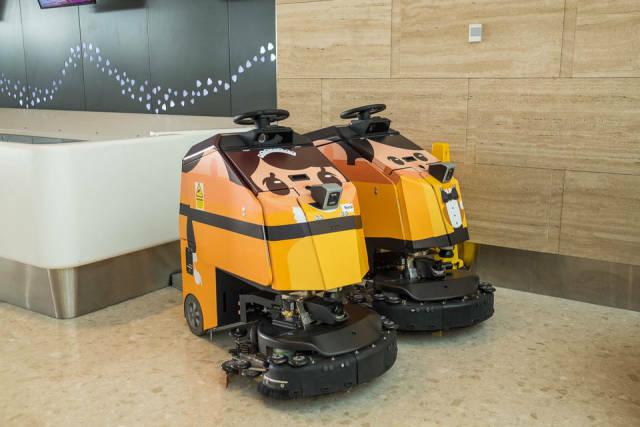 There are automated cleaning robots like these ones in addition to all the automated kiosks. Terminal 4 uses 20% less manpower than conventional terminals. Even the border control process has been streamlined. Singaporean citizens, permanent residents, and visitors who have already registered their fingerprints with the Immigration and Checkpoints Authority (i.e. anyone spending any time in the city-state) can use the automated border control kiosks. It scans your face and matches your fingerprints to verify your identity. Visitors' data is deleted after departure, according to Yim. The security screening process was the most mind-blowing part for me. I'm used to waiting on endless lines while each person removes their belt, their shoes, their keys, laptops, and cameras. It's exhausting. 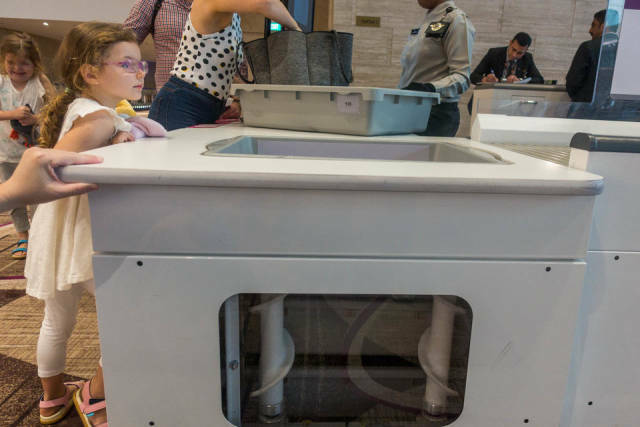 But Terminal 4 uses a new CT scanner system that eliminates the need for removing electronics. It makes the process much faster. It feels like everything has been thought of. The scanners open up onto two conveyor belts — one if your bag is cleared to go, another if it requires more screening. That helps keep things moving for those of us who remembered to take out our liquids. And there's a handy system for plastic bins that automatically sends them back so employees don't need to keep ferrying them to travelers. 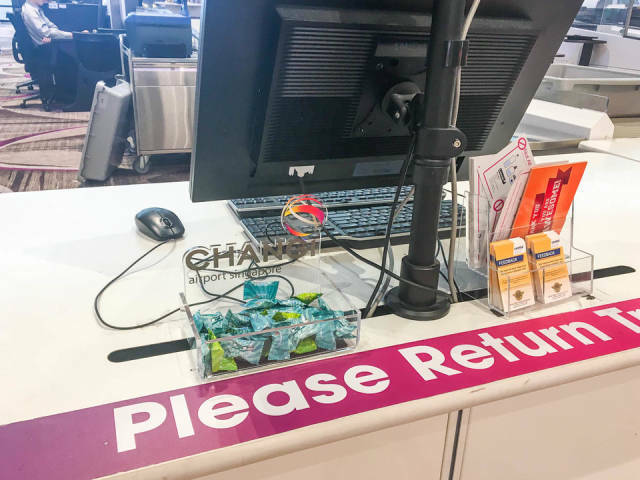 There's even a little bucket of candy that you can take from once you get through security. 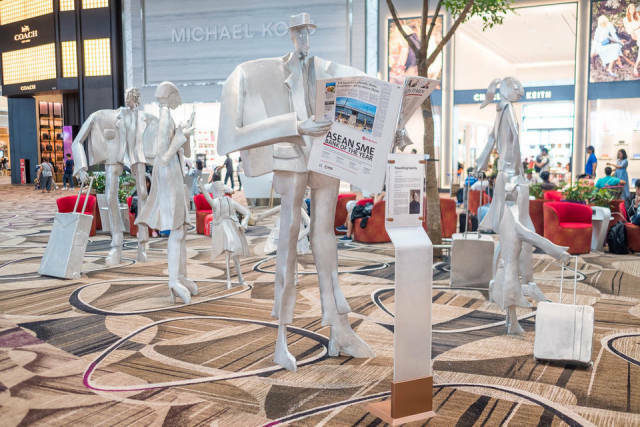 It's small touches that make Changi feel different. 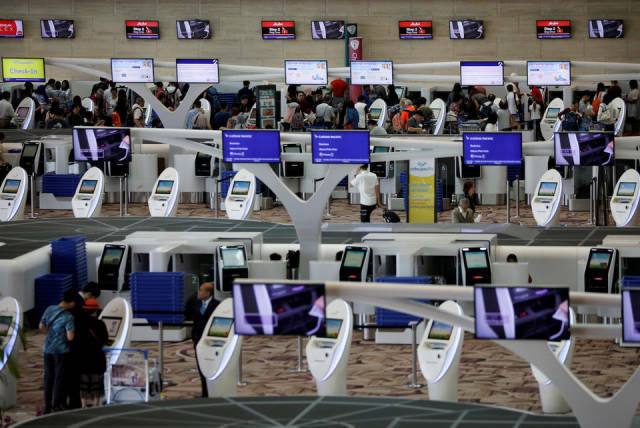 "We knew the airport was not something we could take for granted. In fact it was existential for us. We are a small country that needs to connect to the world. 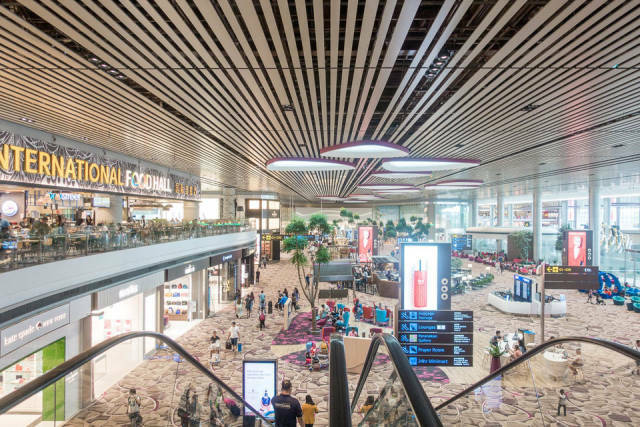 It came down to that we want people to be happy to come here," Changi Airport CEO Lee Seow Hiang said at the Brainstorm Design conference earlier this year. 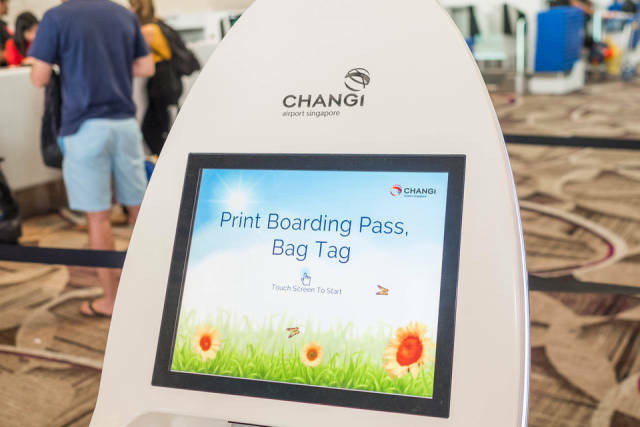 If you buy anything on Changi's online shop, you can have it shipped to the iShop kiosk and pick it up once you get through security. The one aspect of the terminal's design that I didn't like was the duty-free section that you have to walk through to get to the gates. I don't like feeling forced to walk through shops if I'm not in the mood. 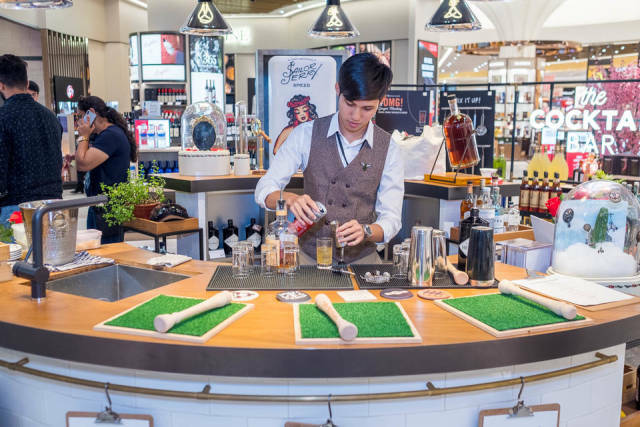 That said, the duty-free section has a cocktail bar where a bartender will mix up complimentary cocktails using the different alcohols you can buy. Bottoms up. 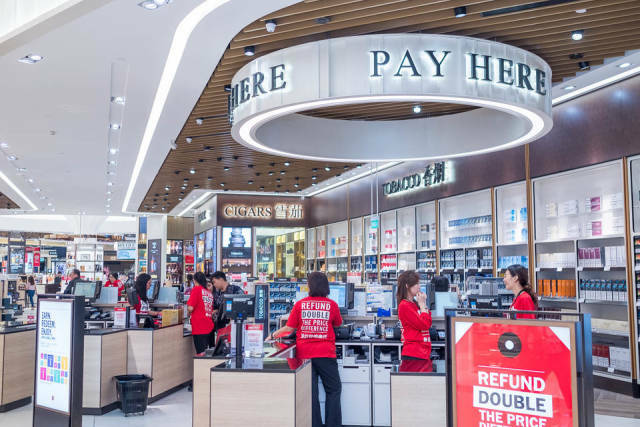 If you are into cosmetics or perfumes — particularly Korean and Japanese skincare brands, which are all the rage right now — the duty-free shop has a deep selection. 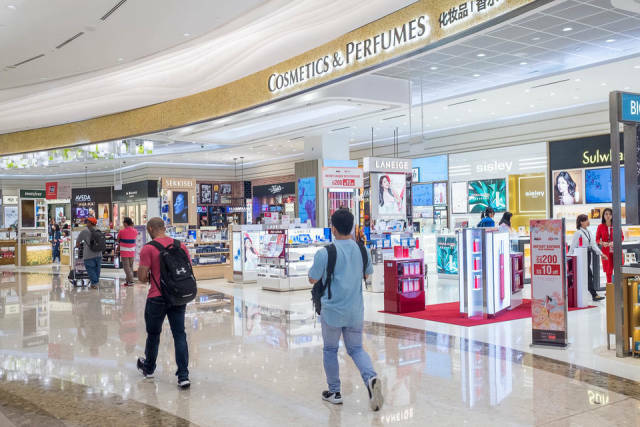 The shop makes it easy with a unified pay point for all of the different duty-free shops. Like most modern airport terminals, Terminal 4 looks like a giant mall that happens to have airplanes attached to it. But Terminal 4 felt open and well-spaced out. Most terminals, even the new ones, feel like giant hallways that push you towards your gate. The atmosphere at Terminal 4 is relaxed. It feels like a place you can mosey around or stop and have a coffee. I didn't expect to like the wall-to-wall carpeting, but it makes the terminal feel warmer. And quieter. There are lot of high-end shops like Swarovski and Kate Spade, but it doesn't feel like it is exclusively catering to wealthy people. 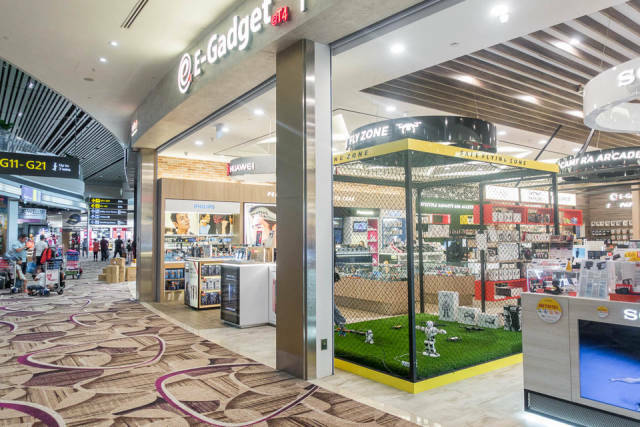 There's a Uniqlo in the terminal and this E-Gadget store, where you test-fly drones in a cage. My favorite shop was the TWG Tea Boutique. 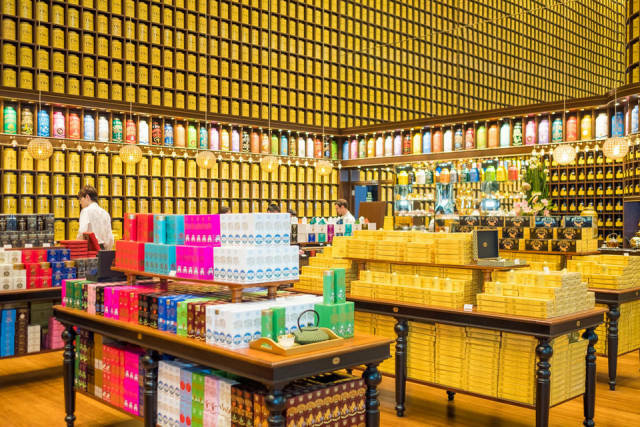 The walls are lined with all the different teas that TWG sells in gold canisters. Mirrors on adjacent walls create the illusion that the rows go on forever. It feels like being in a shop that would be at home in Diagon Alley. 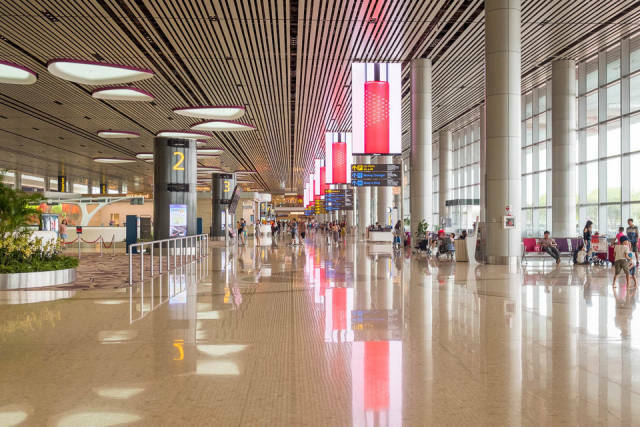 Lee has said that the key to the airport’s success is that "We care." It sounds like hokey corporate-speak, but when you walk through the terminal, the attitude shines through in the sheer number of (often creative) seating options and electrical plugs. And the free WiFi. Every terminal at the airport has public art spread throughout. This sculpture, titled Petal Clouds, features six "clouds" which move gently and rotate their orientation and position over time. It is based on a "classical sonata form" to create an "interplay between form, light and music." It's very relaxing to watch. 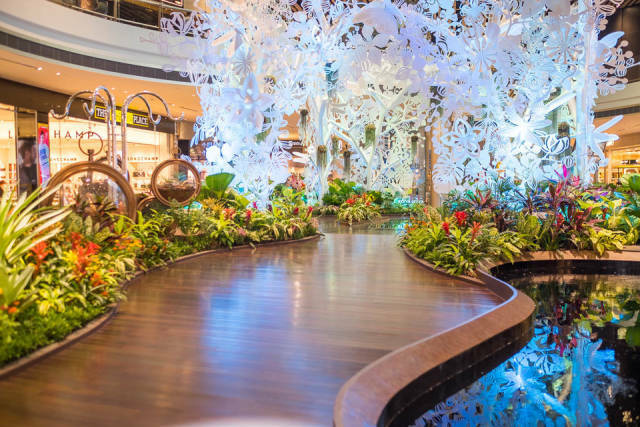 This plant and sculpture garden is set in the middle of the shops. The burst of plants and flowers changes the atmosphere of the room. On every visit I had to the airport, the bathrooms were spotless. It shows a clear attention to detail. 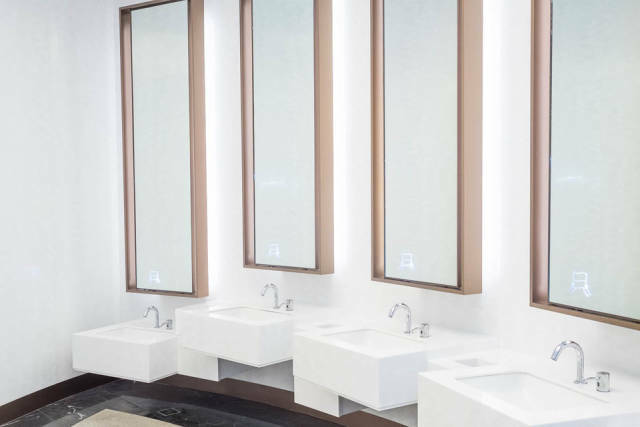 I've been in too many airports where the bathrooms resembled those at a highway rest stop gas station. No thanks. 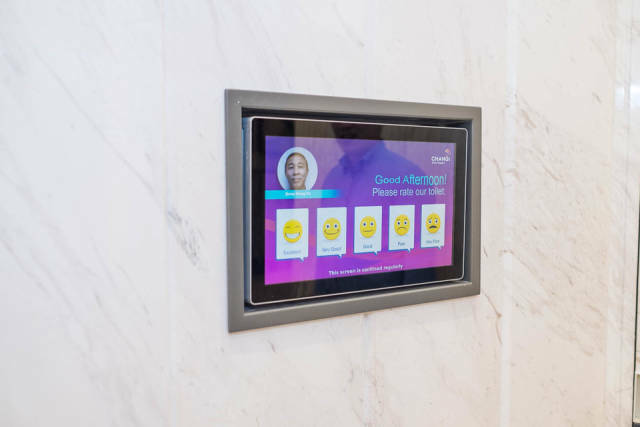 Changi uses a feedback system with a touch-panel directly outside the restrooms where travelers can indicate their satisfaction with the cleanliness and state of the facilities. The results are sent to the supervisor-on-duty's smartphone so that he or she can resolve issues quickly. The feedback kiosks are also located at security and border control. 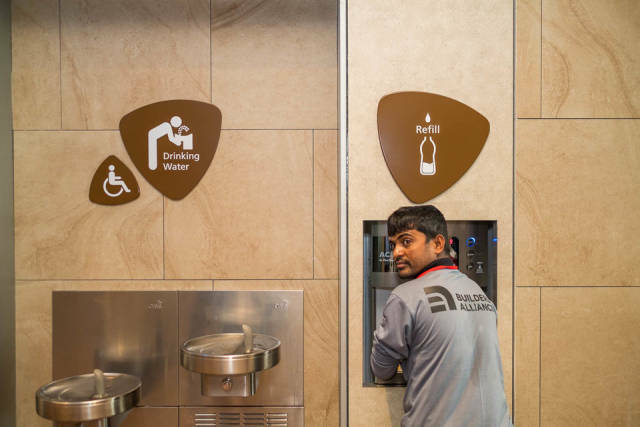 Outside the bathroom is a water bottle and thermos refilling station where you can get cold, hot, or room temperature water. A nice perk for travelers wanting to make tea or instant coffee. 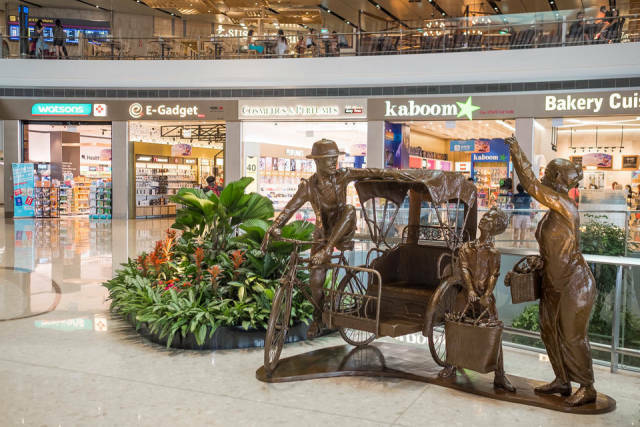 The centerpiece of the terminal is this facade depicting classic Singaporean Peranakan architecture. The shops below the facade are mostly classic Singaporean chains like Old Chang Kee. 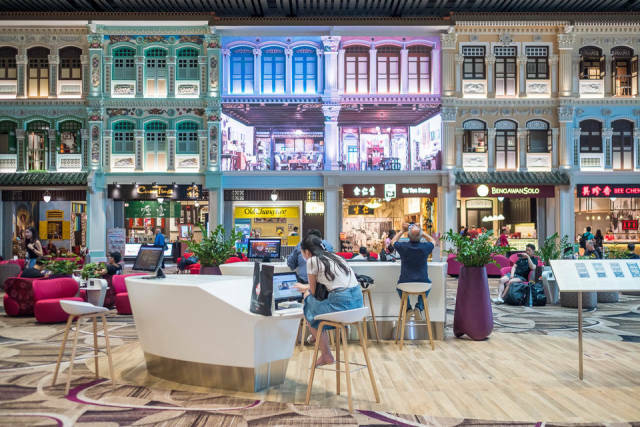 The two center facades are LED screens which display a show telling the story of Peranakan culture, which arose from Chinese immigrants who moved to Singapore and Malaysia several centuries ago and intermarried with the Malay population. 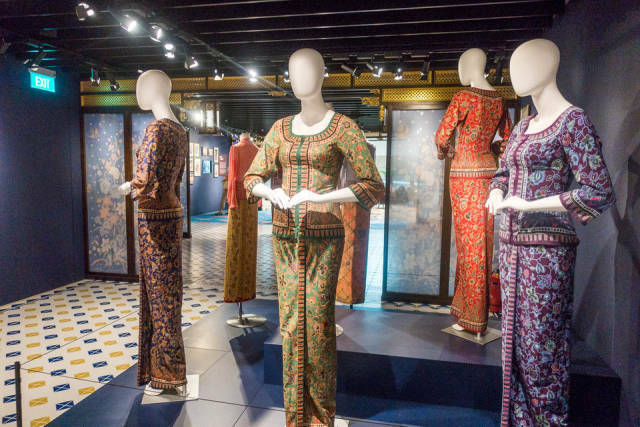 On the second floor of the terminal is a miniature museum teaching Peranakan history. The museum was made in collaboration with the National Heritage Board. 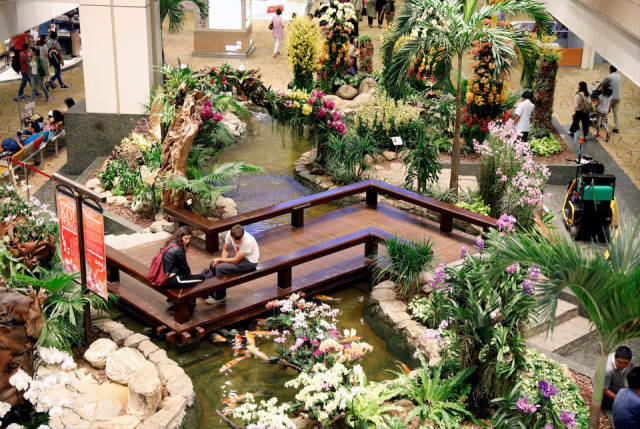 If you are just stopping through Singapore on a layover, it's a cool way to experience some of the culture. There's also a premium lounge for Priority Pass holders or anyone wanting to buy a day pass for 50 SGD ($37). When I passed through, the lounge had complimentary beer, wine, coffee, pastries, and breakfast. They didn't skimp either. I got a hearty bowl of laksa, a spicy noodle soup popular in Peranakan cuisine. 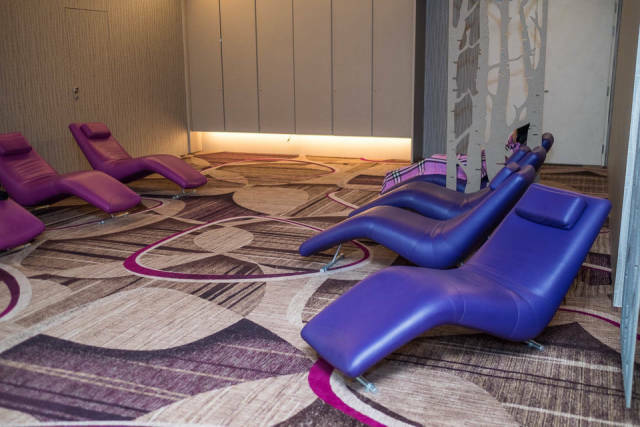 The second floor also has a napping area outside the lounge with these lounge chairs. It's off to the side so travelers on long layovers can get some shut-eye. After checking out all of the terminal's facilities, I nearly missed my flight. But the gate concourse was easy to find and super-wide. The airport calls this departure level "Avenue of the Trees" due to the many species of fig trees here. There's helpful signage so you know how long it takes to get to your gate. Good thing, because I was in a rush. I was so late everyone on my plane had already boarded. But it didn't matter. 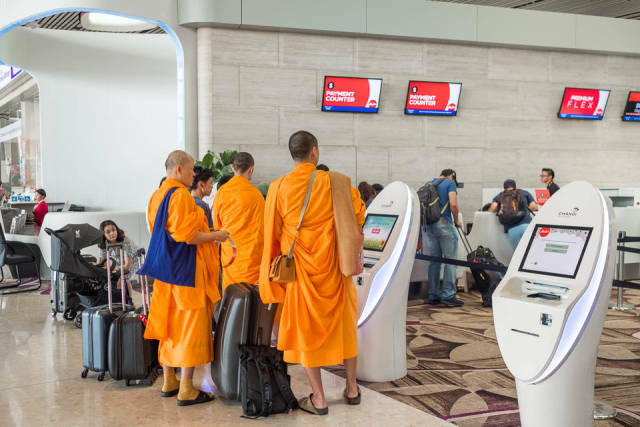 The boarding process was quick with these automated kiosks. 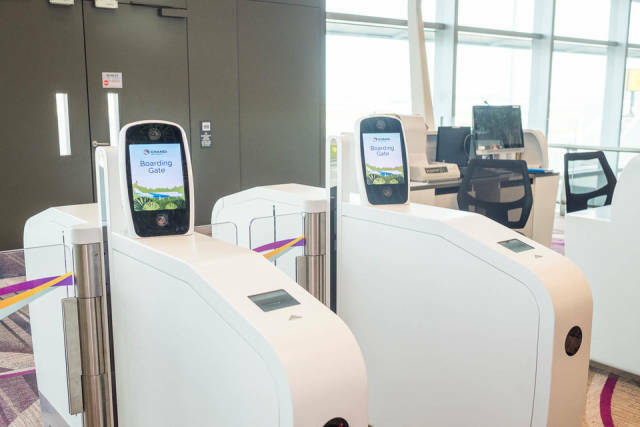 Scan your boarding pass and look at the facial recognition camera, which clears you for entry. If I had more time, I could sit and watch the planes take off from the waiting area. Until next time, Changi Airport. 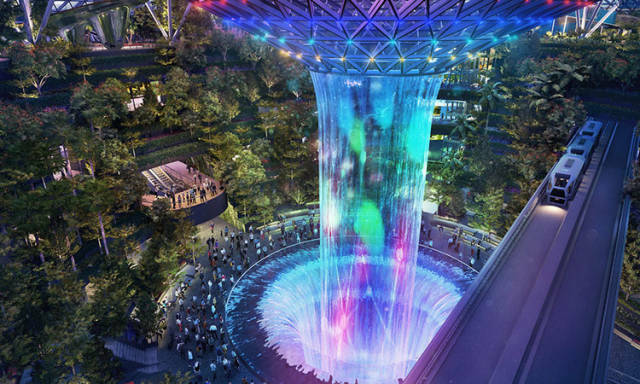 By the time I come back, it is likely that the airport's next big project, Jewel Changi, will be open. 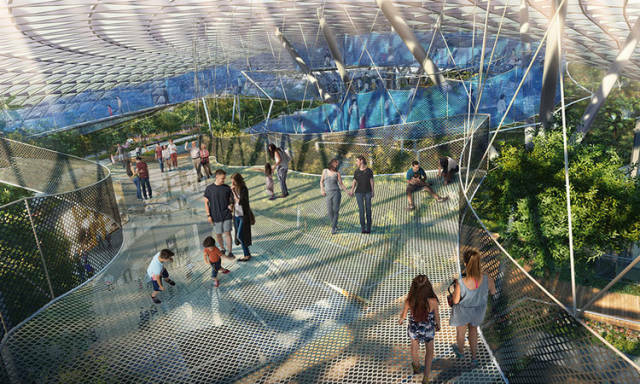 Due to open in 2019, the complex will link Terminals 1, 2, 3 with an enormous glass dome. 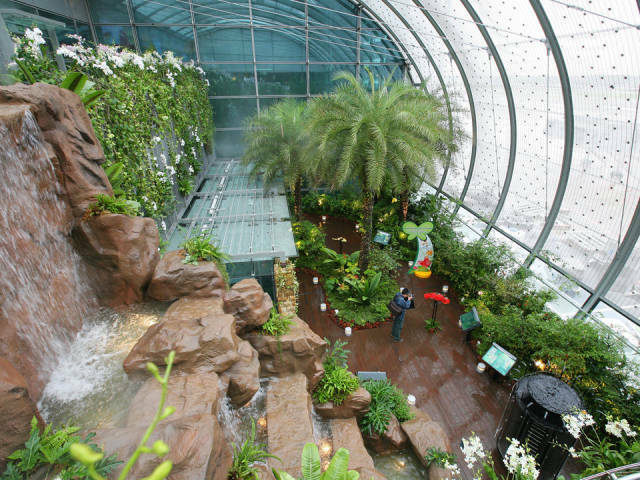 The dome features indoor gardens, 300 stores and restaurants, a Yotel, a rainforest-inspired canopy garden, mazes, and the world’s tallest indoor waterfall. 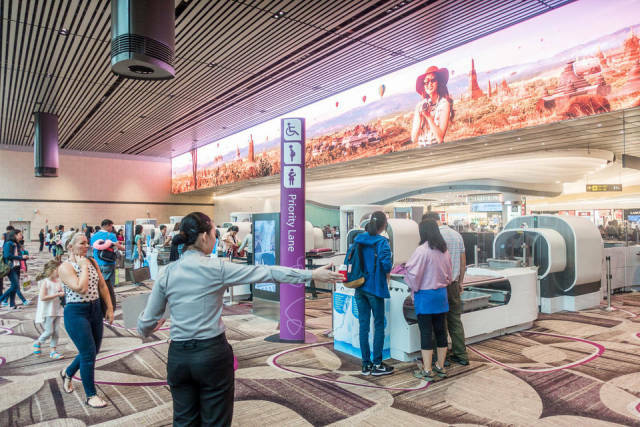 If Singapore isn't careful, the airport will soon be the city’s top tourist destination. it's actually sad that they want to eliminate the need of people during the check in. Nothing is more pleasant than interaction with another human instead of stupid machine. Slightly different to what I remember from when it was an old RAF base back in the 1960's! My dad was based there.